Sweet succulent fruit salads, usually summer treats, are a wonderful change from winter’s root cellar fare ~ squashes, potatoes, yams, carrots and beets. Or brassicas & cold-hardy leafy greens: broccoli, brussels sprouts, cabbage, collards and kale. We had been invited to a friend’s open house/birthday celebration at her new home today. She asked her guests to bring an organic dish to the potluck luncheon. Last night I was mulling over what to put together that would fit on the whole foods vegan detox diet, I had started earlier this week. A large platter piled with our favorite Amagaki persimmons, the very last of the season, beckoned. They were ripening on the kitchen counter along with a half dozen ‘Pink Lady’ apples, bananas, Satsuma mandarins, chermoyas, white and red pomegranates, avocados, lemons and limes. 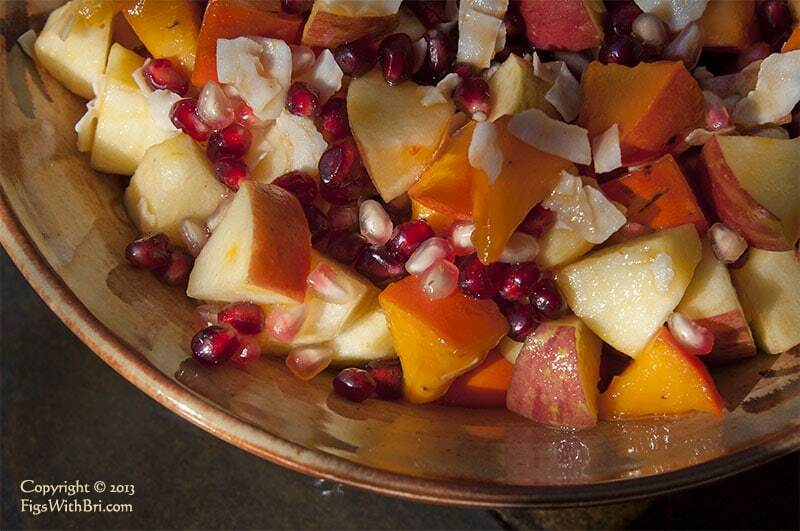 Winter Fruit Bowl with dried coconut flakes & pomegranate arils for salad garnishes. ~ Wash the apples, persimmons, and lemons. ~ Grate the zest of 1-2 lemons. Put the zest in a large mixing bowl. ~ Prepare another bowl of cold water. Squeeze half a lemon into it for soaking the apples to keep them from oxidizing. ~ Trim the persimmons and core the apples, before cutting them into bite sized chunks, leaving their edible skins on. ~ Put the persimmons in the large mixing bowl with the zest. ~ Put the apples into the lemon water. 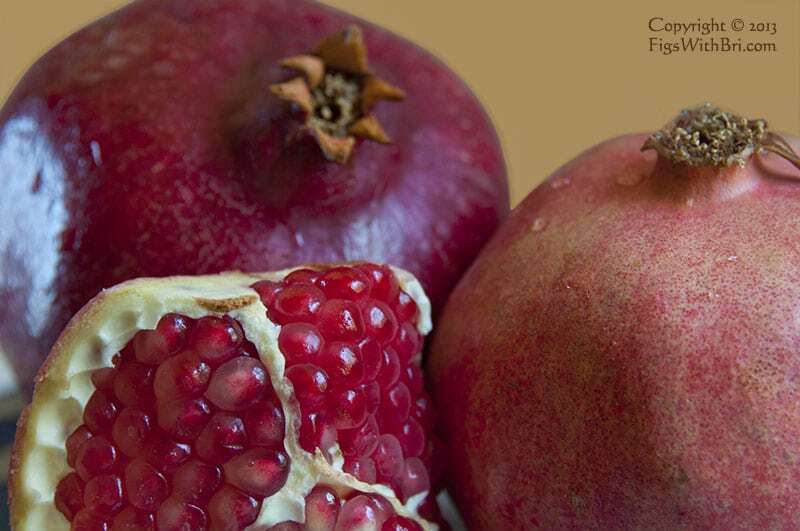 ~Prepare the pomegranates by peeling them and separating the arils in a sinkful of cold water. The leathery peels and bitter pith will float. The arils will sink and you won’t splatter bright red pomegranate juice all over the kitchen, your clothes, and hands. ~ Juice the lemons. You’ll need 1/4 cup. Put it in a small saucepan. 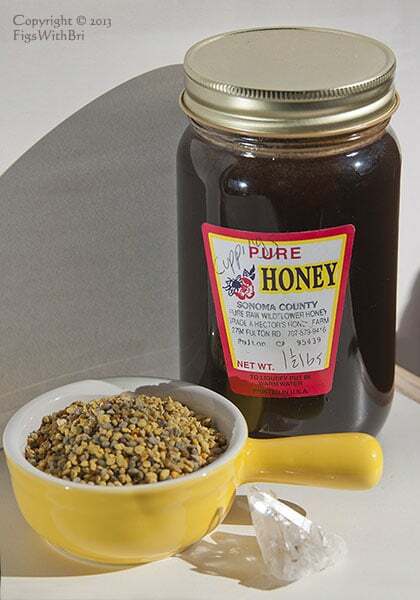 Add the honey. Heat very gently, stirring until the honey has melted into the lemon juice. Take off the heat. Add the dried coconut, so it gets soaked in the liquid. 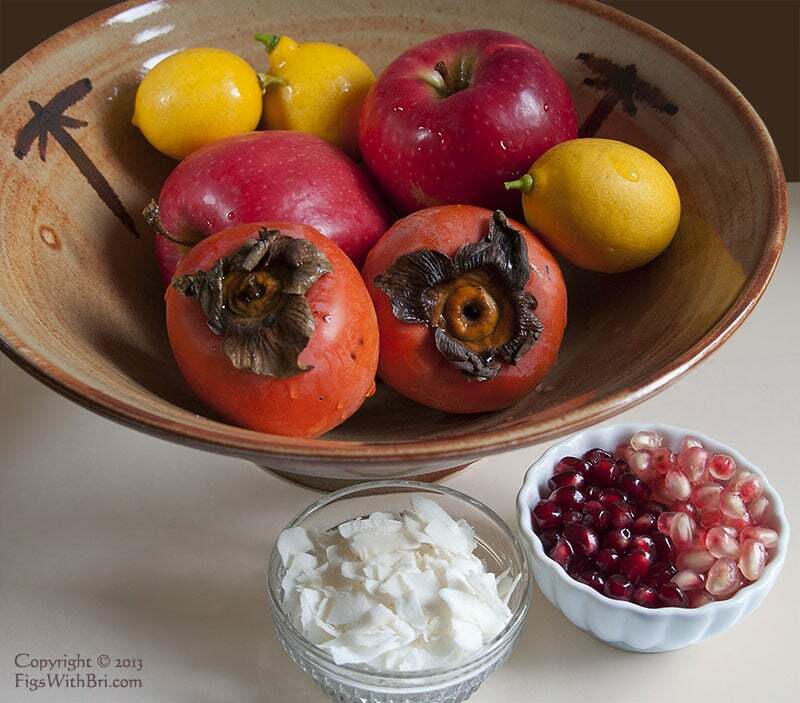 ~ Add the apples and pomegranate arils to the persimmons. Mix well with a gentle hand, so the arils don’t get crushed. Pour the honeyed lemon juice & coconut over the fruit. Mix again. And serve. 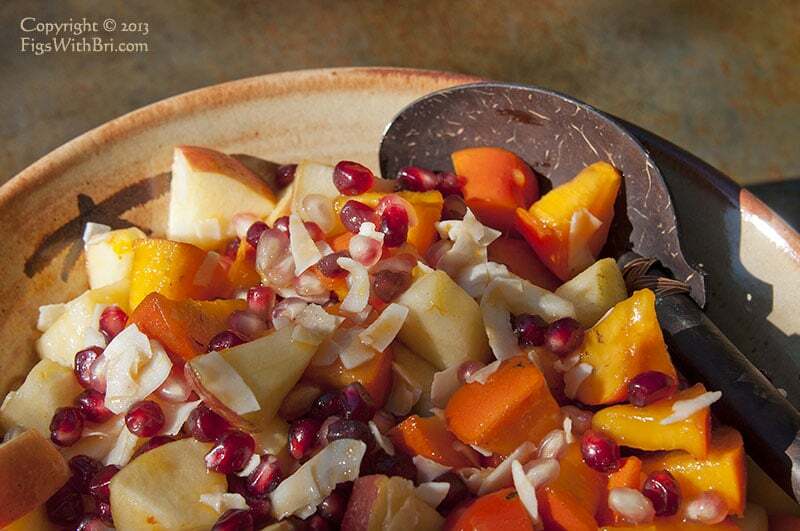 This fruit salad met with instant appreciation at the potluck! Greeted with oohs and ahhs, party guests went back for more until not a shred of coconut or pomegranate aril remained. Lovely looking salad! I’m sure I’ve never seen organic persimmons here in Buffalo, but if I ever do, now I have a prime use for them. Mari ~ I also cook with ‘no spray’ and ‘transitional’ (ie. moving towards organic) produce since organic certification is expensive and requires growers to cultivate on land that’s been pesticide free for several years. Do you have any Asian or Chinese produce markets in town? If your regular grocery stores don’t sell persimmons, you would have your best chance of finding yummy ones there. This salad is well worth the search! Oh, I do have those. They aren’t likely to have organic anything; maybe Wegman’s will sometime, or the co-op; but the season when any persimmons are available here is rather short. I’ll probably have to try this with average-quality fruits. Pomegranate is my all-time favorite!